While exploring you can sometimes go into a close-up view to see an area in more detail. “As we were playtesting, people really wanted to explore more and more and look at the art closer, so we added some investigation triggers, so you can scan around and get close, and get more clues,” Korba explains. “Sometimes you can pick up something in this view. But you can’t just switch to FPS whenever you feel like it, it’s not Call of Daventry or anything.” Graham has a traditional inventory to hold the items he pockets, and in a throwback that will have old fans cheering, picking up an item or solving a puzzle is rewarded with a familiar “you got points!” chime. Gameplay in this initial section involves reaching the dragon, then distracting it long enough to steal the magic mirror. “Talking to [Sierra’s founders] Ken and Roberta [Williams], the main thing [for them] was always story and gameplay working together. Our biggest guideline is, ‘What’s the story moment, and what puzzle or gameplay would be best for that?’” Korba says. Early on, most puzzles involve manipulating the environment to progress past obstacles; in the dragon sequence, for example, you’ll figure out how the contraption that feeds the dragon works and modify it to achieve your own goal. (Who’s actually feeding the dragon will be revealed later, in the part of the game that takes place five years earlier.) 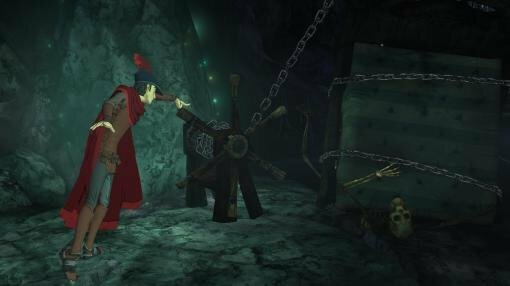 While more advanced graphics and technology allow for more complex scenarios, they’re similar in spirit to pushing a boulder to reveal a hidden hole or finding a way past a troll guarding a bridge, as we did in King’s Quest I. But environmental puzzles aren’t all the series reboot has to offer. Later the game will open up in “a section that’s basically like King’s Quest I, where you can roam the whole forest, and you can grab something from one side of the map and try to figure out where it goes.” There will be plenty of fatal possibilities along the way, but since King Graham is telling this story years later, clearly he didn’t really die—“That’s what would have happened if I had pulled that switch” he might qualify for Gwendolyn, or “I was just checking to see if you were awake”—a clever way of working KQ’s infamous deathtraps into the framing story. Beautiful preview, Emily! Now that I’ve seen a picture of you in real life, you actually look quite a bit like your avatar! Did you catch any hints of possible Linux support in the future? That didn’t come up, but other than “consoles and PC” we didn’t really talk about platforms. Looks great. Hoping it does well enough for a new Space Quest!